Recently attending Quingo fundraiser, the latest community event hosted here. Its great to see the pub become part of the commnity again - Agood local boozer! Must say the Robin has had a ok make over,but will always have a history of past problems; beer prices are dear compared to other local establishments and we all know where the stretford blues drink. 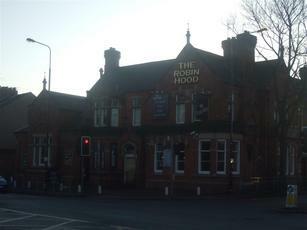 The offical Stretford branch of the Manchester City supporters club have moved from the Metro Club to the Robin Hood. We are a family orientated club and would not take our members to a club that was not very well run. The lads that own the pub and the manager have made us very welcome. The food is very good and the place is spotlessly clean. They have changed the lay out of the pub to accommodate us in a separate room and it can be used for functions. Memberships for the supporters club can be obtained from any of the bar staff. The staff at the Robin Hood are doing a very good job you should give them a try.